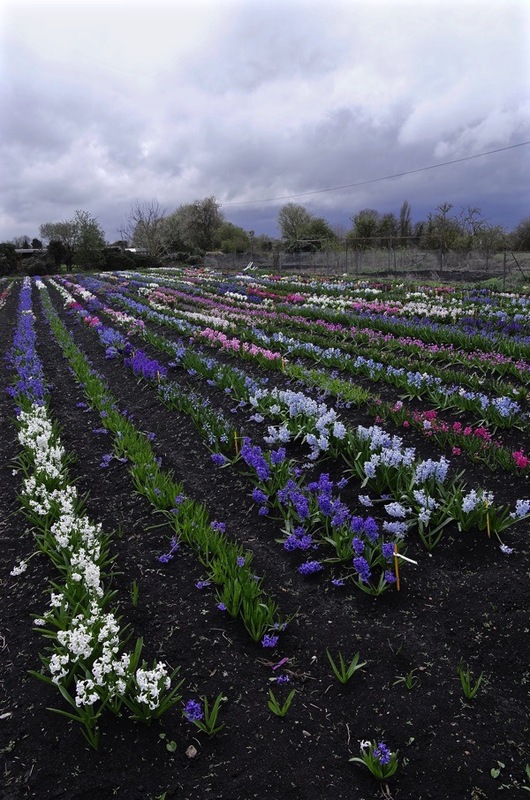 On a blustery day last week, I took the train up to Waterbeach outside Cambridge to visit Alan Shipp, Hyacinth Grower who cultivates two hundred and forty-three different varieties of this favourite flower, which are all in full bloom now. I stood in the rain, inhaling the fragrance of the gentle breeze wafting over Alan’s field of hyacinths, flourishing in the rich soil of the silted water-meadows of the River Cam. 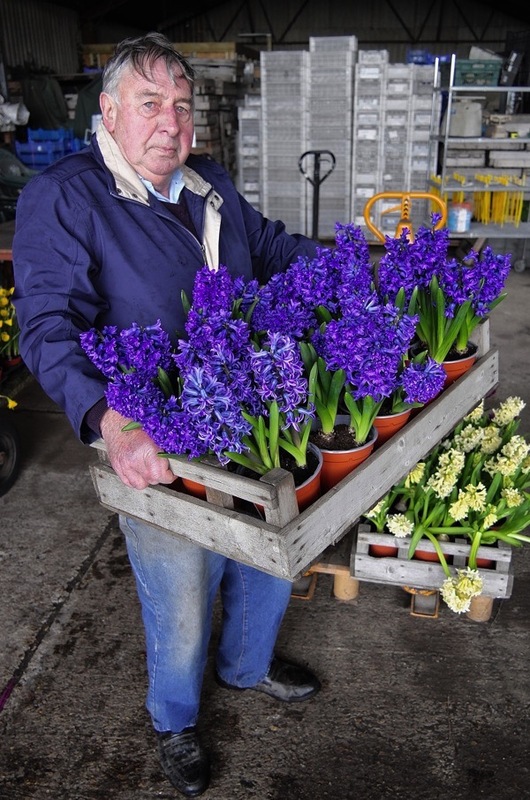 Alan Shipp is Britain’s only Hyacinth Grower and is also the Custodian of the National Collection of Hyacinths. He has the world’s largest collection of varieties and knows more about this intriguing plant than anyone else alive. Each year at the end of March, Alan opens his hyacinth nursery to the public at peak flowering time, drawing international press attention to the tiny village of Waterbeach for this celebrated event in the horticultural calendar, which sometimes attracts over a thousand enthusiasts – travelling from far and wide to gawp at this incomparable hyacinth spectacle. The lines of multicoloured hyacinths stretch to horizon. They seem to sing against the black soil. The rain makes them shine and then the sun makes them glow, luminous with light beneath a dark East Anglian sky. Alan Shipp & I stood alone together in the field contemplating the hyacinths in silent pleasure – until the storm broke, when we took shelter in Alan’s greenhouse where he told me the astonishing story of his life in hyacinths, as the rain hammered on the glass and the wind rattled the panes around us. “In the eighteen-eighties my grandfather, Thomas Shipp, won a pony and whip in a raffle. To put it to some use, he managed to borrow a harness and cart, and went round door to door selling vegetables. Then he bought a piece of ground and started growing his own, and that is this piece of ground. That was how it all started, growing fruit and vegetables. Eventually when my father, Kenneth Shipp, got involved, he started wholesaling the produce we grew ourselves. In the fifties, we started selling imported fruit too which we used to bring up from Spitalfields Market on Monday and Wednesday each week. At the entrance to the Floral Market on Lamb St in Spitalfields was the Floral Cafe and I can still remember the bacon sarnies. It was a whole slice of fried gammon between two pieces of bread. We used to try and get there at four-thirty or five – it was a wonderful atmosphere. The owner was a chap called Leonard Swindley. I said to him once, ‘I’ve seen the porters just walk behind the counter, make themselves a jug of tea and disappear. You can’t carry on like that, you’re being robbed!’ He replied, ‘Can you think of a happier way of losing money?’ I left the argument defeated. We stopped selling produce after one of our salesmen left and set up on his own in opposition. We had been growing acres and acres ourselves but the method of vegetable production changed out of all recognition. We would have a little plot of a couple of hundred square metres of leeks that we would plant by hand but today, two miles away, there is a field of one hundred and forty-five acres of leeks. To get a reasonable living, we needed a larger farm but I know of no land that has come up for rent in Waterbeach in the last thirty years. So in 1985, I decided I could best increase the output per acre by becoming a hyacinth grower. It was just sheer chance. There was a clearance sale at a bulb nursery at the the other side of Cambridge, including hyacinth bulbs. So I bought one hundred, twenty each of five different varieties, and planted them because I had always been a very keen gardener. After the leaves died down, I dug them up and moved them elsewhere but there was one that I missed. It had rolled under a shrub. When I found it next summer, it had put its roots down but the rest of the bulb had been eaten away where it was exposed and, upon this surface, small bulbs had formed. The slugs had actually illustrated for me the method of propagating hyacinths. I thought, ‘I wouldn’t mind doing this,’ so I got a planting stock from Taylors Bulbs of Holbeach. Their general manager gave me advice, he said, ‘Alan, don’t grow many varieties.’ I didn’t really heed his advice because I now have two hundred and forty-three. And that’s how I got started! I discovered there was a National Collection of Hyacinths at Barnard Castle and I got in touch to say that, as I was the only hyacinth grower in the country, I was willing to propagate for them free of charge. They brought me two bulbs each of fifty varieties that I propagated and which became the nucleus of my collection. I seemed to come up against a wall, regarding getting more varieties, after one hundred and eight varieties. Then I got a letter from a lady in Lithuania who had a collection of hyacinths that she had assembled from all over the former Soviet Union – things I’ve never heard of, things that we thought were extinct! She’d got the names but knew nothing but about them so I sent her my research and we exchanged bulbs. I thought I had missed double-flowered yellow hyacinths by one hundred years but lo-and-behold she had got two – one with a name and one unidentified. The one with the name was in catalogues from 1897 and the other I grew as ‘unidentified double-yellow hyacinth.’ Then in 2013, by sheer chance, a friend of mine came across an illustration of it by Mary Delany in the British Library. That was the world’s first double-yellow hyacinth, introduced in 1770! When it was introduced, it was £800 a bulb yet Mary Delany had painted it, so I wondered how she got access. But it was reported she had contact with Court and it was George III’s bulb that she illustrated at the time he was at Kew Palace in Kew Gardens. So that was a breakthrough. I am on the Royal Horticultural Society’s Bulb Committee. It was the ‘Daffodil & Tulip Committee’ but, in 2012, the remit embraced all bulbs and we had an intake of other specialists. 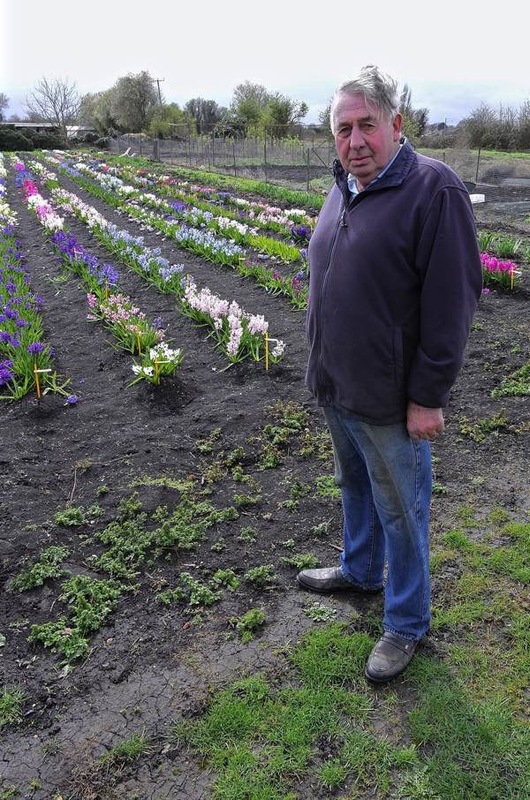 One of them was Alan Street from Avon Bulbs who regularly wins a gold medal at the Chelsea Flower Show. ‘Alan,’ he said, ‘I’ve got an unusual hyacinth, it’s red and white. I can tell you’ve heard of it by the look on your face.’ It was Gloria Mundi. 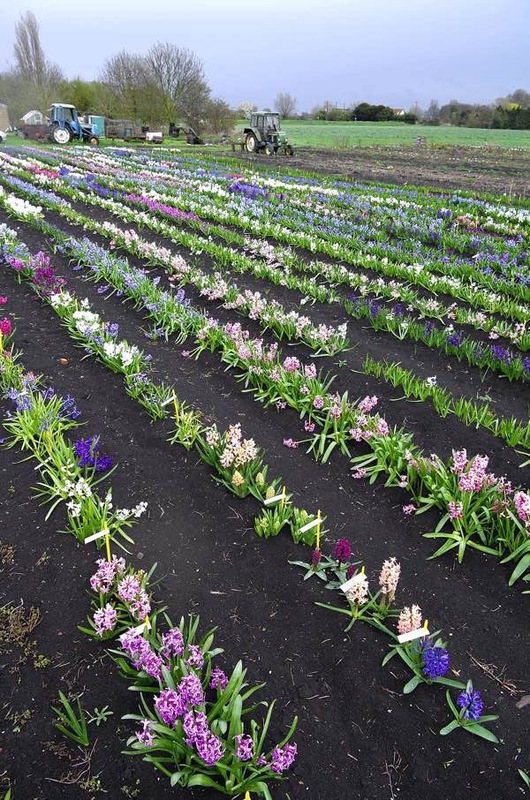 Hyacinth Mania was a hundred years after Tulip Mania. It was started by the Scottish Horticulturalist Peter Voorhelm who found a white double hyacinth with a rosy coloured centre in 1708. Previously, all double hyacinths had been discarded as inferior because they are deformed by extra petals in the middle, but he so liked this one that he propagated it and called it Konig Van Groot-Brettanje in honour of William of Orange – and that started Hyacinth Mania for white doubles with coloured centres. Gloria Mundi was a lost variety of white double with a coloured centre in the catalogues in 1767. Alan Street had a friend in Switzerland called Ingrid Dingwell and Ingrid had a gardening friend who was a lorry driver called Theo, who took a load of humanitarian aid to Romania during the Ceaucescu era to remote village with a population of three hundred and seventy-odd souls. Theo’s friend fell in love with a local girl and married her, and Theo was given hospitality by the bride’s father at the wedding. To show his gratitude, Theo gave the bride’s father a pocket watch and the old man asked Theo to help himself to any plant growing in the garden, including bulbs of a hyacinth called Gloria Mundi. Theo gave them to Ingrid who sent them to Alan Street who grew them for fifteen years, oblivious of what he had. The year after I identified them, Alan took a pot to the RHS and they were given an award, two hundred and fifty years after the variety had been lost. I cannot say that what I do is much of a business, it is more a hobby that gives a little bit of income and the selling of the bulbs has financed the conservation scheme. 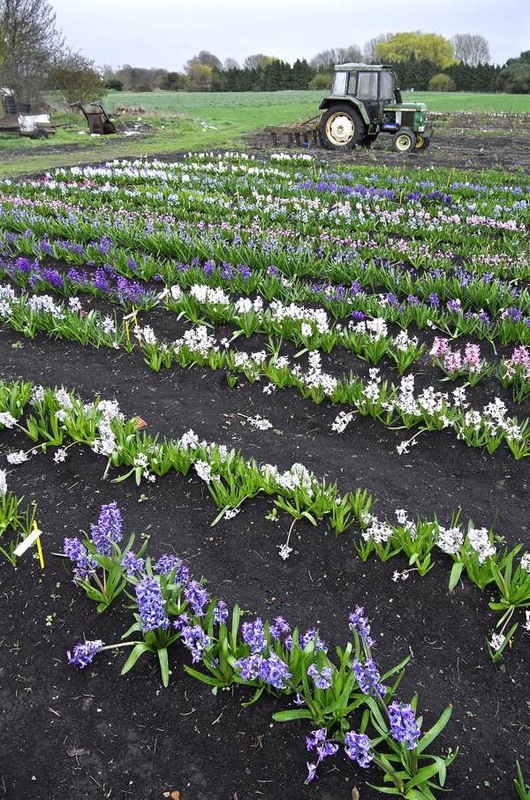 Without my work, the National Collection of Hyacinths would have just disappeared. 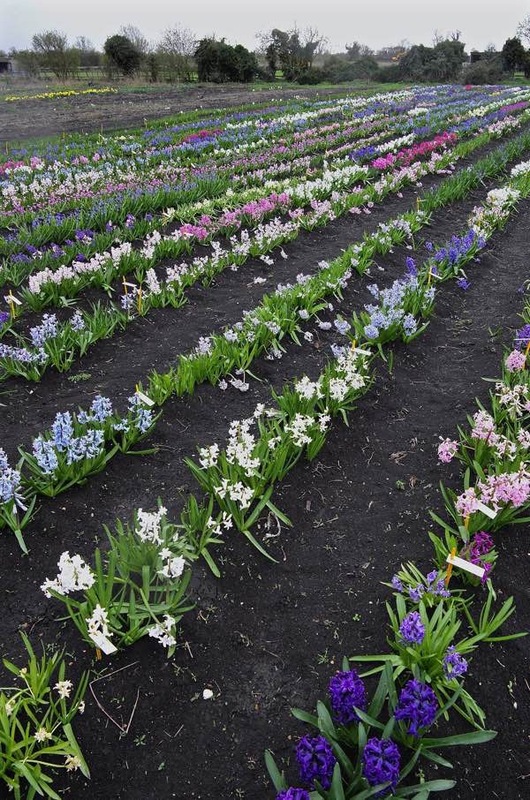 I have saved well over a hundred varieties of hyacinths from extinction. At seventy-eight years old, the next problem I have is who is going to carry it on after me? I am looking for someone. I love hyacinths. There is their fragrance, there is their beauty. There is no other flower that can give you this range of colours at the end of March. 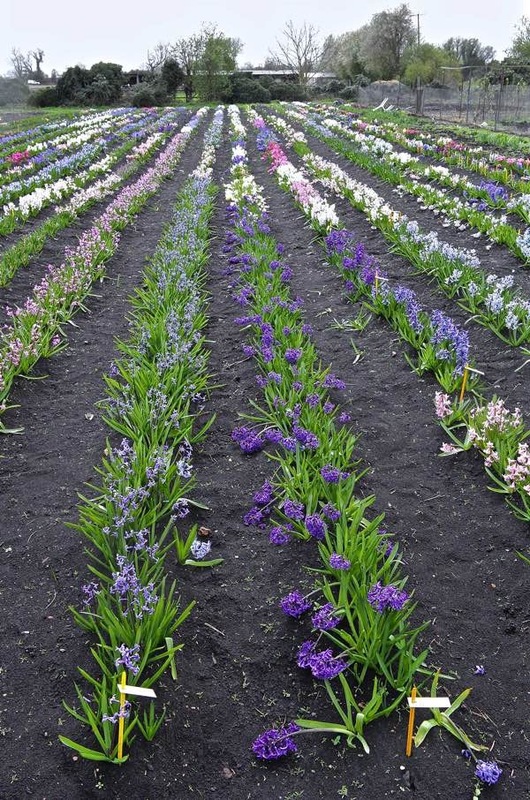 If someone gave me a paint chart, I could match every colour on it with hyacinths. I would have a job to get black but I could get pretty close to it. They are so fascinating. They are all evolved from just the one wild species growing from eight hundred to a thousand metres in the hills at the border of Iran, Iraq, Syria and Turkey. It is believed that the Romans may have brought them to Europe because there is a sub-species which grows on the Mediterranean coast of France. How did hyacinths get from the Levant to there, unless they were taken as bulbs by the Romans and gone feral? The first recorded introduction of hyacinths to Europe was by the Flemish Botanist Carolus Clusius who was appointed Prefect of the imperial gardens in Vienna in 1573 by Ferdinand II. Ferdinand’s ambassador to Turkey was Ogier Ghiselin de Busbecq and he brought back tulips, crocuses, cyclamen and hyacinths to the palace gardens – all the bulbs from the Levant. Unfortunately, Ferdinand died that year but Clusius got a job at the botanic garden in Leyden and took the bulbs with him. That was the start of the Dutch bulb industry. Clusius may have introduced hyacinths to Britain when he visited in 1590 and John Gerard records growing them in his garden in London in 1597. Hyacinths would undoubtably have been included among the ‘florists’ flowers,’ along with tulips, carnations, auriculas and roses, grown competitively in the East End during the eighteenth and nineteenth centuries. In the Victorian era, florists’ competitions were rampant up and down the country, and hyacinths always featured. Wonderful posting thank you and don’t the hyacinths look even more beautiful in the weathered wooden crates rather than in the plastic variety. this is a gem amongst your many great articles. I want to know more about the Romance in Romania- what a great start to the day to read of this mans love of his work. The missing treasure among Tulips is also red and white – Augustus. I les Corbières in France wild tulips grow too so perhaps there is a link to the Caucuses that goes back in history- or perhaps it was the Romans .. Sitting here looking out through my garden door at Mrs Blackbird having a bath in the dish of drinking water just outside I can also see that one of my cream hyacinths is on bloom, no doubt it is a very ordinary one but I love them. I was interested to read the comments of Caroline Murray and whilst I do not wish to argue the point but wish to say that I understood that Mary was married off at the tender age of 16 to a 64 year old man, her parents considering it a wise move. Consequently she became a widow at the age of 24, eventually remarrying again to a Rev Delaney who was an Angelical preacher in Ireland. After Delaney’s death Mary was alone but had the advantage of good connections to the Court of Caroline and George the third, this was how I assumed that she had access to a bulb that cost £800, a largish fortune in those days. Caroline, I like to have my facts correct so I would welcome all due corrections to my current facts. Agree with the above superlatives of ‘one of your best.’ Fascinating! This year I’ve been volunteer-teaching teenagers to envision, build and write their own blog, thanks to your class, GA. I will definitely use this character sketch as an exemplary model in class this week. We love Alan and his bulbs here in the States, too! Thanks for a wonderful portrait in words of a wonderful man — a generous, down-to-earth visionary — who has enriched so many gardens and lives. Thank you for your wonderful work! If you sell your favorite varieties to OHG, I’ll buy them and grow them in my gardens in Massachusetts. I have a bunch already and I love them. I so appreciate what you do! Good Morning from Maryville, Tennessee, at the foot of the Great Smoky Mountains National Park. It was such a pleasure to sit back and read about your adventures in growing hyacinths. I’ve never grown a one in my own gardens here in TN but my dad always had them in our spring gardens and he was adventurous and we had them early when he always planted them in shallow glass bowls with just colorful rocks and bulbs. We so enjoyed them in the house. Looks like after reading a few of these articles, I’ll be purchasing a few hyacinths for my garden. I love the sweet smell and truly have no idea why I have neglected such a lovely addition from my own gardens. Thank you for your love of such a precious flower.